Since 2007 the studio has been located in the center of New Canaan, steps away from the train station and the shops of Elm St. At 1100 sq. ft. the space is small but very efficient. Filled with natural light the shop houses machinery, bench space, office and timber storage. Furniture is made in the studio starting from raw lumber and ending as finished product. Machining is done with a mix of vintage industrial equipment and highly accurate contemporary European machines. Joinery is hand fitted and assembled to specification. The piece is then finely sanded and finished. 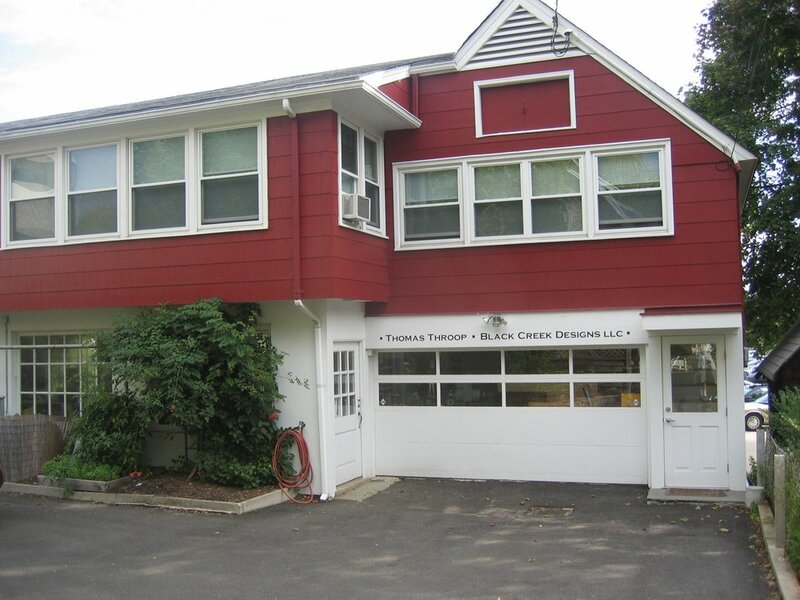 The studio since 2007, located in the center of New Canaan, CT. Steps away from the train station with travel to and from NYC every half hour. An array of furniture on display in the studio for a visiting client. In the background my bench space along with various machines both vintage and modern European. Our vizsla, Primo, has been the shop dog since 2014, preceeded by Radley and Simon both Vizslas. On occasion I take on apprentices. Above, my nephew Pete learns to flatten a large slab by hand. I have had 10-12 over 25 years, the last coming from South Africa stayed for a year.